Having Trouble Checking your Pump Fuel? Here’s how. 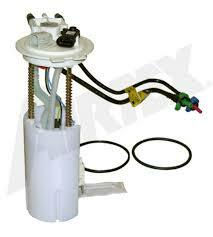 A fuel pump is often regarded as an integral component in any car but not in every internal combustion engine device. There are certain engine-powered vehicles such as old motorcycles that do not have the need for fuel pump but instead rely on gravity to get fuel from the fuel tank. This process is done via a hose connected to the engine. With the advancement of modern technology cars are rapidly changing and are engineered to fit the growing needs of its consumers. In today’s non-gravity feed designs, cars require fuel pumps. Instead of channeling fuel through a hose it needs to be pumped from a fuel tank to the engine. The delivery of fuel works under high pressure to the fuel injection system or under low pressure to the carburetor. Fuel injected engines often utilize electric fuel pumps that are attached within the fuel tank. There are some fuel injected engines that have two fuel pumps, one is for low pressure or high volume supply pump found inside the tank while the other is high pressure or low volume pump found on or close to the engine. 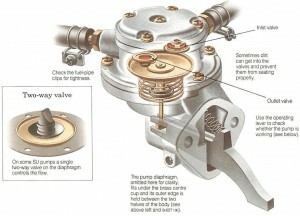 In carbureted engines they often use low pressure mechanical pumps that are frequently attached outside the fuel tank. There are two kinds of fuel pumps as mentioned above. One is mechanical which are commonly used in carbureted cars while the other is electric often used in cars with electronic fuel injection. The principle of delivering fuel in a carburetor is relatively simple. It makes uses of a vacuum to propel fuel into the engine. This is the same vacuum that suctions the mixture of both air and fuel into the engine. In the case of carbureted engines, additional assistance is needed that is why they require a mechanical fuel pump. An electronic fuel injection, on the other hand, is a computer operated system that closely and regularly monitors air-fuel ration, exhaust contents as well as throttle position. The reason why electronic fuel injection is located inside or near the tank is because it doesn’t use a vacuum to draw the fuel so there basically is no pre-existing force. After knowing and differentiating fuel pumps, you’re probably wondering why there is a need to check it every so often. Well, one of the reasons why you should is the fact that fuel pump failure can happen any time at any day and it is best if you know what to do if and when your fuel pump starts to malfunction. You will know that your fuel pump is acting up when it starts to sputter and after a series of raucous sputtering the engine inevitably dies. When your car dies in the middle of the road even when your gas tank is full then most likely there is a problem with your fuel pump. You can check if your fuel pump is defective by simply doing the following easy steps. This method requires you to check your fuel pump fuse. More often than not it isn’t really the pump that’s troubled but the power that supplies the pump. Locate your fuse box (if you don’t know where it is, go back to your manual and read it again). Once you’ve located the fuse box trace the fuse for your fuel pump. As soon as you find it pull it out and see if there are any signs of failure. When a fuse is damaged you will notice it to be broken or burned but if it looks intact with no broken wires or burnt marks then your next action would be to check all the other fuses connected to the fuel system and inspect it one by one. 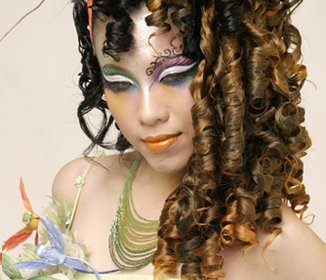 If you notice wires that are worn out replace them as soon as possible. The next smart thing to do is to check the voltage of your pump. Test your voltage to ensure that good charge that leaves the fuse goes straight to your pump. You can also do a drop test with the use of a voltmeter. This is to check if the power wire reflects full voltage and the grounding wire is grounded appropriately. If this test shows nothing unusual then it is probably your fuel pump that’s the main problem and it has to be quickly replaced. This easy to follow systematic approach is very helpful for drivers who are always on the road and who constantly encounter fuel pump problems. If you happen to be unfamiliar with the mechanics of your vehicle then don’t hesitate to call a mechanic or if you think you can be able to handle it yourself, always go back to your manual.